One giant container ship can emit almost the same amount of cancer and asthma-causing chemicals as 50 million cars. Globalization and the offshoring of American jobs is directly responsible not only for good paying jobs leaving the US, but also for massive amounts of pollution put into the environment leading to increased global warming. These mammoth machines guzzle fuel at a rate of 16 tons per hour — equivalent to nearly 400 tons a day. They consume 86% of the oil exported from Saudi Arabia. So not only would bringing these jobs back home bolster the middle class and decrease the economic divide between the 99% and the 1%, but it would also forestall climate change. Confidential data from the maritime industry shows that just 15 of the world’s biggest ships may now emit as much pollution as all the world’s 760 million cars. In addition to getting fossil fuel burning cars off the road, we need to be concerned about getting container ships off the seas. US academic research which shows that pollution from the world’s 90,000 cargo ships leads to 60,000 deaths a year and costs up to $330 billion per year in health costs from lung and heart diseases. In light of the pollution produced by container ships, the US has proposed buffer zones along the US coast in which dirty container ships would not be allowed to operate. These rules proposed in 2009 were supposed to go into effect in 2016. Whether or not they have gone into effect is unclear. If they have, you can bet that the Trump administration will rescind them. There is new technology which, if installed on container ships, would lower the amount of pollution they put out. However, this technology is expensive. That would add to the price of transport and finally to the price of consumer products. Much of government is in effect supported by lobbyists that want to kill any and all regulations that increase costs for any industry. And of course the pro-business Trump administration wants to get rid of all government regulations. As usual all attempts at regulation of this or any other industry are put off until a later date because of the need for further study. When that date is reached there is only further obfuscation until a new later date is set. The Wall Street Journal reported that in October 2016 the International Maritime Organization (IMO) and its 170 member nations have agreed to reduce sulfur pollution from container ships by the year 2020. The IMO said the sulfur content in fuel will be limited to 0.5%, far below the 2.5% average today. But in order to assuage business interests, the reduction of sulfur will occur in a “setback.” That means that the full effect will be phased in gradually in order not to disrupt business. Critics have warned the deal will significantly raise fuel costs at a time the shipping industry can least afford it. 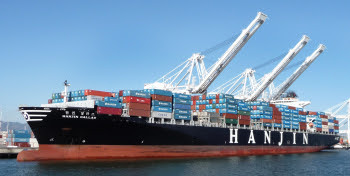 Some estimates said that this accord could cost the shipping industry about $40 billion. In international waters ship emissions remains one of the least regulated parts of our global transportation system. The fuel used in ships is waste oil, basically what is left over after the crude oil refining process. It is the same as asphalt and is so thick that when cold it can be walked upon. It’s the cheapest and most polluting fuel available and the world’s 90,000 ships chew through an astonishing 7.29 million barrels of it each day, or more than 84% of all exported oil production from Saudi Arabia, the worlds largest oil exporter. 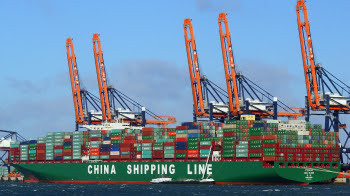 South Korea is planning to build ships which can carry 22,000 containers that would be 450 meters long. The amount of pollution produced just by these ships alone is equivalent to having another 29 billion cars on the roads. In place of these fossil fuel burning ships which produce great amounts of pollution, there is the possibility of using nuclear engines to propel them. There are already 150 ships in operation that use nuclear propulsion. Most of these are submarines, but this technology could be adapted for container ships. Why isn’t it? Again it’s a consideration of cost. 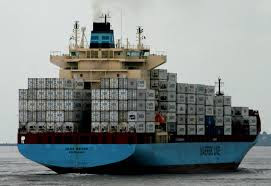 The shipping industry would rather go with relatively lower cost ships even though it means that they are exporting into the environment large amounts of pollution for which there is no cost to them. The cost is to the health of average people in addition to the long term threat due to global warming. Airborne pollution from these giant diesel engines has been linked to sickness in coastal residents near busy shipping lanes. Up to 60,000 premature deaths a year worldwide are said to be a result of particulate matter emissions from ocean-going ship engines. The IMO, which regulates shipping for 168 member nations, has mandated cleaner fuels by 2020, but that doesn’t mean very much unless there is enforcement by the US and other governments which is unlikely to happen since lobbyists for the industry will get Congress to reduce regulations rather than increase them. That way the container ship industry can continue to run at a lower cost level and can continue to pollute. Is the Pollution Worth Cheap Goods? Several countries have already instituted buffer zones within which container ships must use a cleaner and more expensive fuel. That fuel is more expensive, but it also cuts pollutants dramatically. Sulfur, for instance, is reduced by 98%, and particulate matter is reduced by 85%. Is there any enforcement mechanism or are these buffer zones so much hooey? Is the 230 mile US buffer zone really in effect and really working? Are scofflaws being fined and brought to account? Or is the risk of using dirty fuels just the cost of doing business with or without fines? 90% of consumer products travel around the world in these dirty, polluting container ships because producing them overseas with cheap labor offsets the transportation costs and maximizes profits as long as the externalities of health damaging pollution and global warming are not figured in. Regulating this industry would make it cheaper to manufacture these products here at home and return jobs to American shores. As usual the driving force of international commerce is the production of cheap consumer goods produced by cheap overseas labor. The dirty little secret is that the true cost of this cheap stuff is borne by environmental degradation causing sickness and disease. The true long term cost is a planet too hot to live on. John, I had no idea that container ships burn the concentrated waste of oil refining and that this dirty waste constitutes approximately 84% of all Saudi Arabian oil exported. I can’t believe that this horror story is not being screamed from the world’s rooftops. Thanks for writing about it here. How about disclosing the research so the reader can be informed on the basis of the original information. Do we really think Donald Trump will do what many Presidents before him have already done? And that is to put a high tax on fossil-fuel burning container ships. Some of the revenue obtained could be used to rebate the owners of these shipping companies to build nuclear and other non-polluting ships, and the rest could be used to pay for some of the governmental costs associated with global warming. Will Trump propose doing this? I doubt it, but I challenge him to do so. Thanks for informing all of us. I never really thought about it. But it just confirms my general attitude about our species at this point in history. Our neocortex and our primative brains are not a match as far as our survival goes! We want the most money, the most statis, the most power and be a member of the strongest “tribe”. We cannot cooperate, solve problems to benefit all. We have no altruism yet have developed through the power of our neocortex the means to completely destroy everything! What a combo. Thanks John, you do a wonderful job of keeping us all informed.